This Object of the Day celebrates one of many treasured objects given by Clare and Eugene V. Thaw to Cooper Hewitt, Smithsonian Design Museum. It is published here in memory of Eugene V. Thaw. Click on this link to read more about the Thaws and their gifts to Cooper Hewitt. The popularity of boldly-decorated faience must be viewed as part of a broader taste for pattern in eighteenth-century France. At the turn of the century, the country was part of a growing global economy, with goods supplied by wide-reaching commercial trade networks. French interest in Indian chintz skyrocketed, alongside the trend for Asian-style ceramics. The color-fastness of dyes used in Indian chintz was one of the material’s most desirable properties, just as the high-firing colors of faience were valued for their richness and resistance to fading. Similarly, the pristine white ground of printed cottons and the milky whiteness of tin-glazed earthenware worked together to introduced an unprecedented brightness to the domestic interior. Cotton upholstery and patterned faience set the stage for fashionably dressed men and women for whom chintz was the fabric of choice. 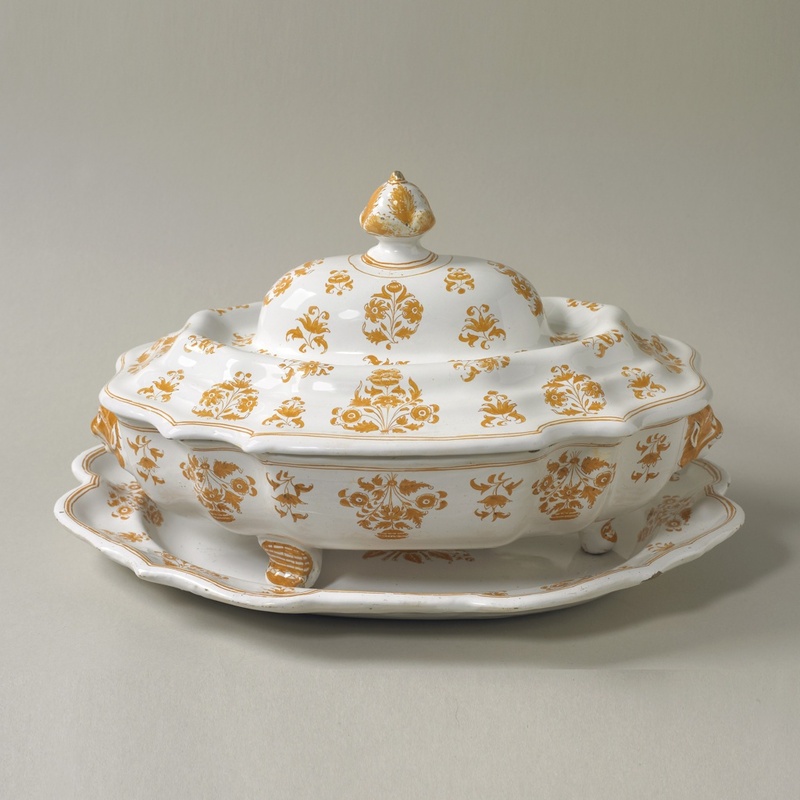 A French textile printed during the country’s ban of Indian cottons shows repeating bouquets that are similar to the so-called ‘potato flower’ design that was frequently used in the faience factories at Moustiers, and can be seen on this tureen with monochrome yellow decoration. Rebekah Pollock is a design historian specializing in ceramics and 18th-century print culture. She was a formerly an MA fellow in the department of Drawings, Prints and Graphic Design at Cooper Hewitt, Smithsonian Design Museum. This tureen and textile are currently on view in Moustiers Ceramics: Gifts from the Eugene V. and Clare E. Thaw Collection at Cooper Hewitt through April 29, 2018.